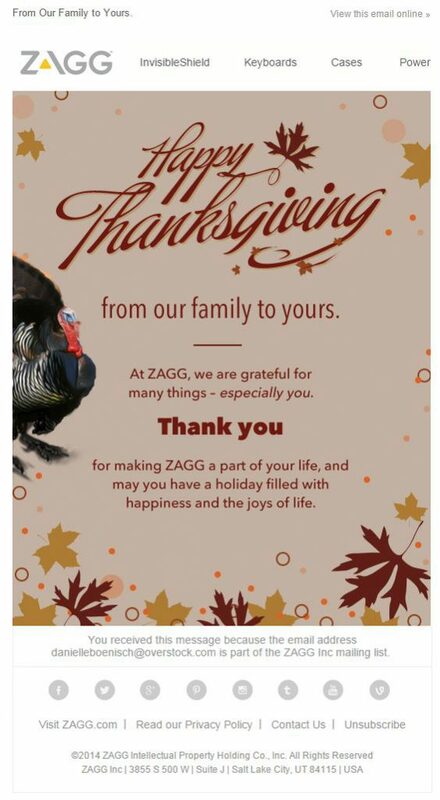 Including key imagery is an effective way to ensure your readers will associate your email with Thanksgiving. 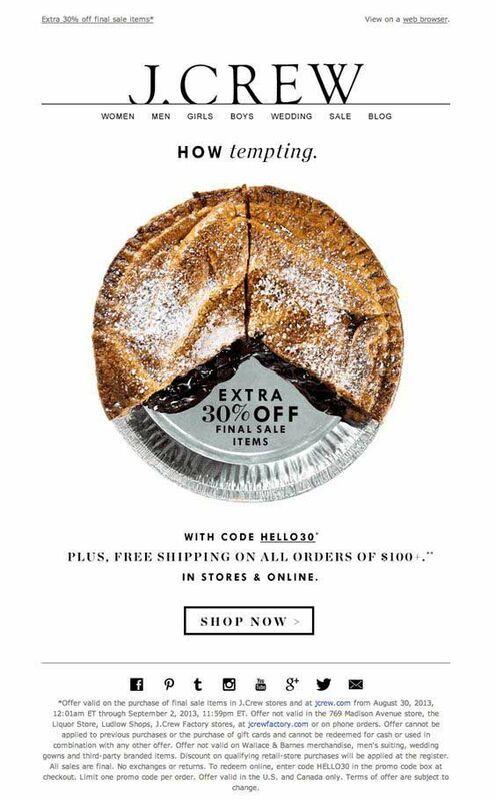 This simple yet effective example from J Crew includes the classic Thanksgiving pie – immediately catching the attention of customers hungry for a sale. 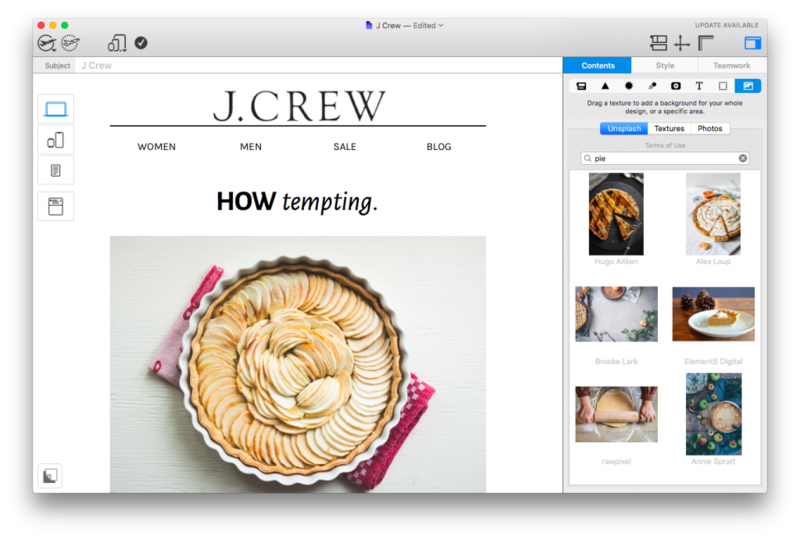 Mail Designer 365 offers seamless integration of the Unsplash photo library, giving you unlimited access to license free stock photos to use in your designs. Try out the search feature to find the perfect image for your newsletter or choose from our curated selection. Every email designer knows the power of a good font. At this time of year, brush fonts dominate. 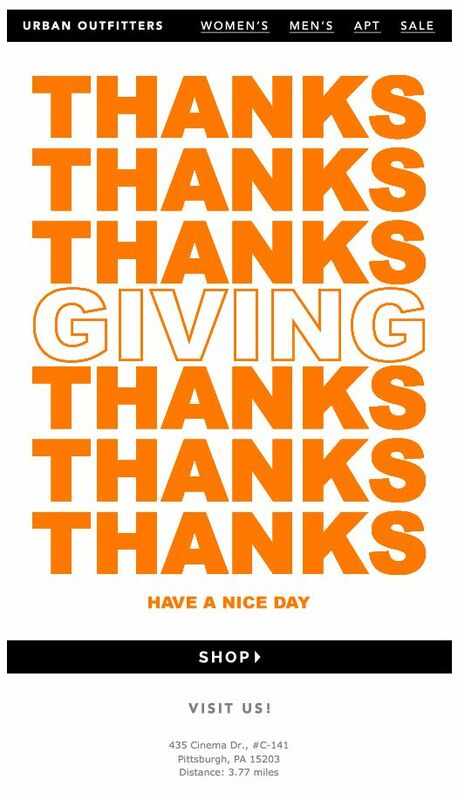 A traditional brush font is an elegant choice for your Thanksgiving email and evokes feelings of nostalgia due to its retro style. This is especially prominent in this fun design by ZAGG. Mail Designer 365 contains a huge selection of web fonts which you can use in your email designs. 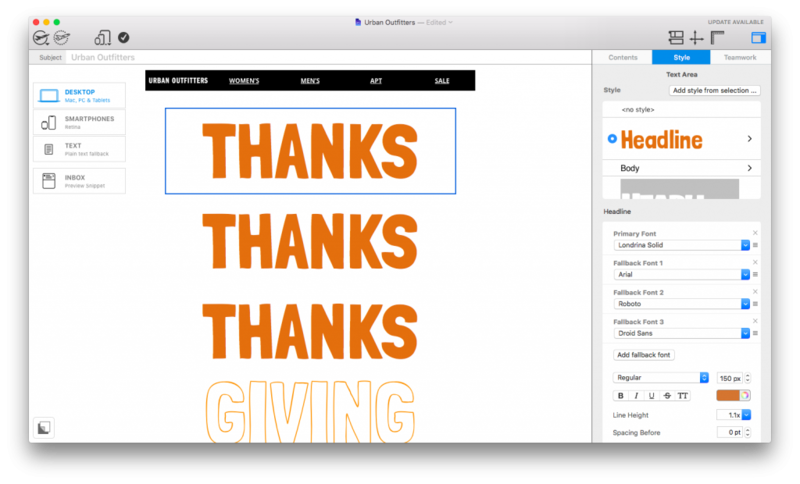 Among these is a wide variety of brush fonts perfect for your Thanksgiving designs. Try out text styles in Mail Designer 365 to recreate the bold and vibrant text effect seen in the Urban Outfitters newsletter. Experiment with fonts, sizes, color and more to create the perfect autumnal text effect for your design. 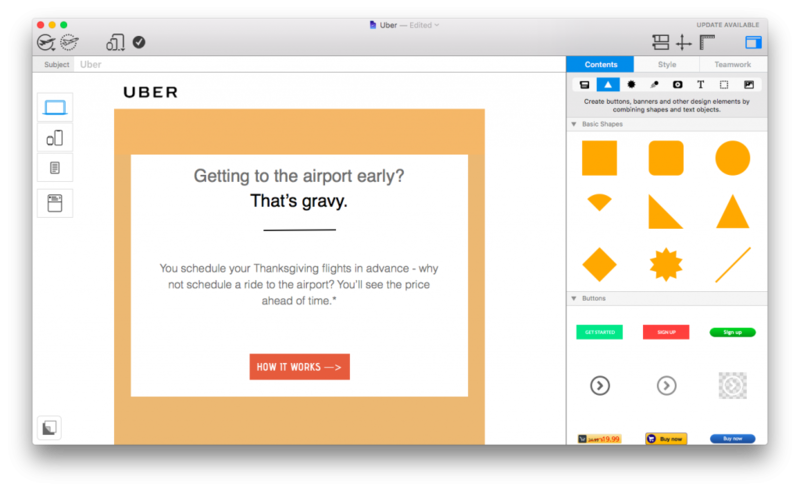 The call-to-action (CTA) is a central part to any email campaign; Thanksgiving included. As mentioned already, seasonal colors such as orange and gold are a great choice for your email design. Twinned with a bold font and a clear layout, your CTA should work wonders – just like in this design from Uber. Building CTA buttons is easy in Mail Designer 365. Explore our graphic library and choose from pre-made buttons, or make your own using shapes and graphic text styles. 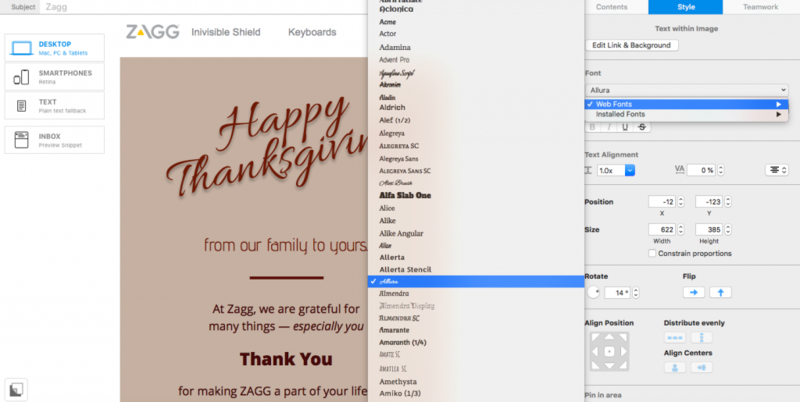 We hope you have found these awesome examples of Thanksgiving email designs inspiring. As you can see, it’s easier than ever to recreate these professional email newsletters in Mail Designer 365. With just a few clicks, you can be on your way to building standout email campaigns.